'Romance' in the context of the bedroom, can mean many different things to different people, and the idea of a 'romantic' bedroom, in the literal sense, can be as varied as romances themselves. When it comes to interior design, though, 'romantic' has a specific meaning, and harks back to the 19th century and a particular strain of the Romantic movement in literature and art. In its own time, this Romanticism had a strong theme of nostalgia for the pastoral rural life thought to have been lost as a result of the Industrial Revolution; Romantic interiors of today maintain this tradition—think country cottages, billowing, gauzy curtains, and sprays of florals. The bedrooms below, then, are less about 'romance' than they are about 'Romance'. Wooden furniture is a key feature of the romantic style—traditional and all as it is. The modern version of romantic wood furniture often involves an aged paint finish on the wood—as can be seen here. The base colour palette of a romantic bedroom is white, but of course needn't be restricted to that. The bright yellow walls of this bedroom give nostalgia a contemporary update, even while the furniture hews to the romantic theme, right down to the swags on the curtains and scrollwork headboard. Stripped and white washed wooden floorboards add a cool and fresh tone to the room, while a rug adds the essential softness. First appearing in 1820, brass bed frames are the quintessential Romantic bedroom centrepiece. They can be seriously opulent pieces, with ornate scrolls, curves, intricate floral designs and delicately wrought finials, or they can be, as this example is, simple yet well-proportioned. Note the re-covered chair in modern purple and the modern take on a Victorian sea-chest at the foot of the bed; modern nods to nostalgia. Wicker—or rattan—was immensely popular in the Victorian era, with many believing it to be more sanitary than upholstery. It's a classic romantic material, and you'll find wicker chairs, wicker chests and wicker baskets dotted throughout bedrooms decorated in a this style. 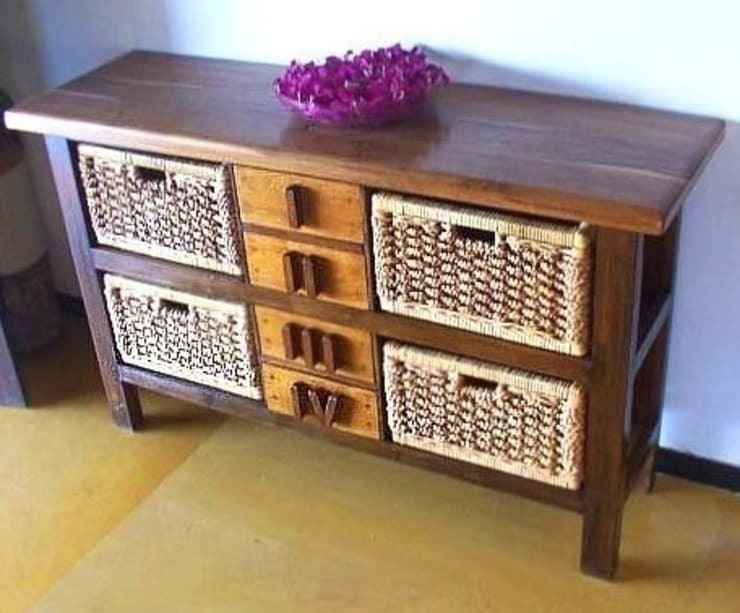 You can add a subtle splash by integrating wicker into a wooden cabinet, as seen here. 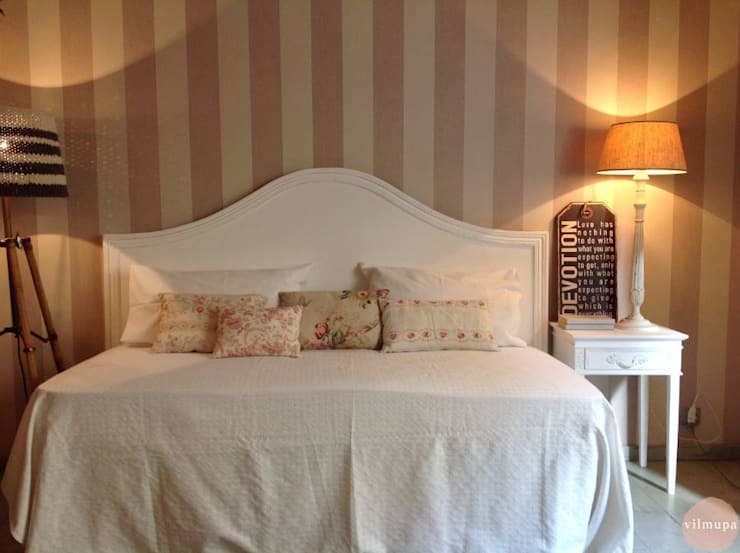 Though the candy-striped walls are more mid-20th than mid-19th century, this bedroom screams romance. Romantic florals, which hark to the movement's rural nostalgia, are the pastel pinks or blues of meadow flowers—seen in the throw cushions on the classically romantic white, soft-linen covered bed. A lamp made from a natural material such as wood, and throwing off a soft light is also a key element of a romantic bedroom. Both the nightstand and the lamp base are, on closer inspection, in an aged paint finish, again in keeping with the nostalgic feel of this style. When we think Romantic, we think soft, and feminine. This chair ticks the wicker box—see above—while whispering of an elegant romanticism. 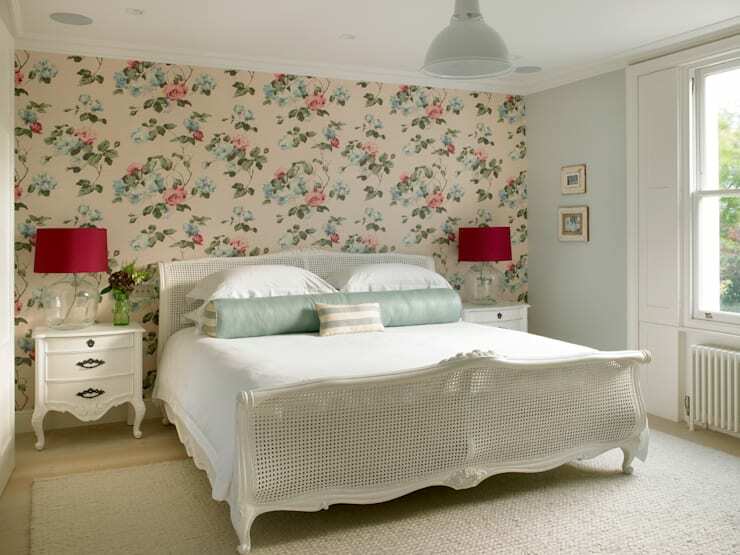 Add the necessary floral splash with a feature wall—English roses, as here, are a perfect choice. 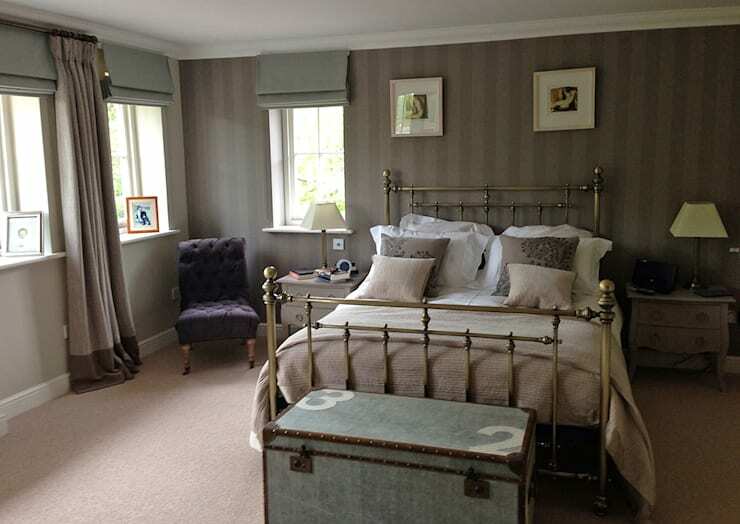 Keep the rest of the design simple and light, in pale, fresh tones of blue, grey or green. Again, stripped wooden floors are softened with a natural fibre rug. A splash of fuschia gives the briefest nod to modernity, as does the candy stripe on the bolster pillow (in a Romantic bedroom you simply must have a bolster pillow), but in this room you can imagine yourself nodding off in an English country garden. 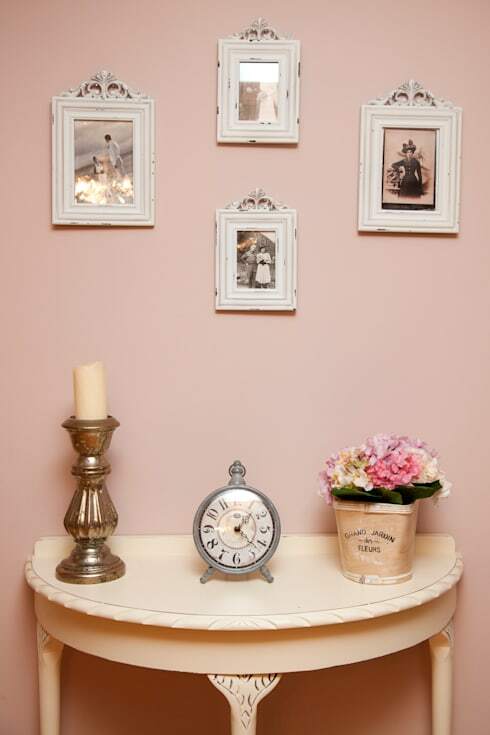 A delightful idea for a Romantic bedroom—a selection of old photos in distressed frames, along with an antique clock and brass candlestick. Clusters of knick-knacks like this add charm to a Romantic bedroom—it's a style that invites you to your show off your vintage finds, rather than having them hidden away in drawers or cupboards.